There are a number of reasons why I choose to machine quilt instead of hand quilting the main reason is that it enables me to finish quilt tops much more quickly and do many more of them. 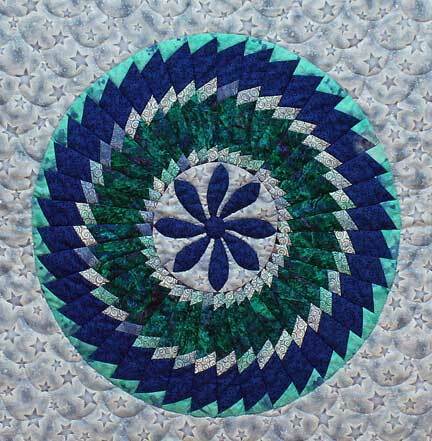 Machine quilting is fast and sturdy and when done well very beautiful. Machine quilting has its own unique charm and character. In comparison to hand quilting the designs are more defined and textured. If you machine quilt a quilt make it look like machine quilting and not an imitation of hand quilting. Machine quilting is much faster than hand quilting , but not easier to learn. Take time to learn the feel of machine quilting. Listen to your sewing machine as you quilt and develop a rhythm with the motor speed of your sewing machine. It often helps to quilt to music in order to develop a steady rhythm and constant speed.